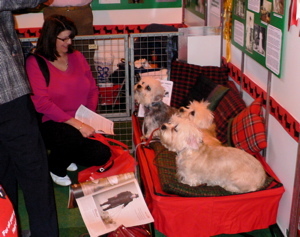 The club received some lovely feedback from a visitor to Crufts praising the hard working team of Lynda Bromley and all her helpers who give their time so generously to work on the Dandie's stand in Discover Dogs. 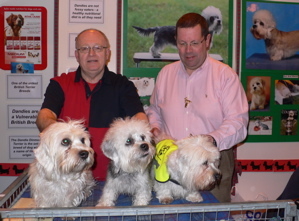 "Just wanted to complement you on having the best host of any stand at Crufts in the Discover Dogs exhibit. I was there on Thursday and the man on the DD stand did you credit. He didn't overplay his hand, nor did he ignore me like some others(!). He was a genuine enthusiast and if I was in the market for choosing a breed to keep (Sadly I'm not) I would be ringing one of your puppy enquiry numbers.